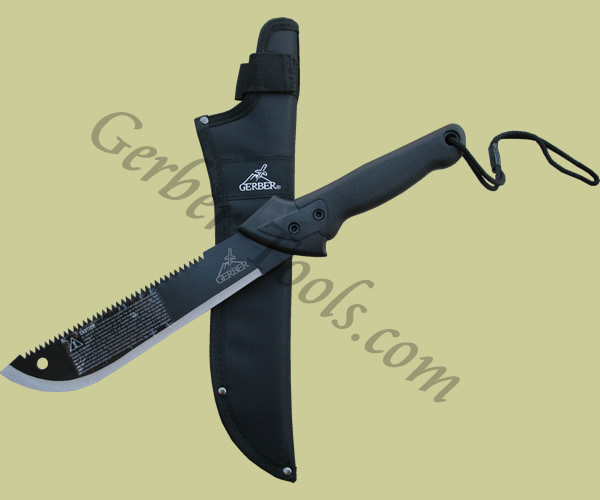 The Gerber Gator Machete Jr model 31-000759 is great for clearing brush and vegetation. At 18.75 inches long, this machete was designed to be big enough to take a whack out of something and fit in your backpage at the same time. The high carbon steel blade has a sharp edge on the impact side and a saw blade on the spine. The handle features the famous Gerber Gator Grip and has a lanyard on the end. A sturdy riveted nylon sheath is included for safe and convenient transport.